Apple's newest iOS brings major "emojification" of Messages and third-party app integrations in Siri, Maps, and more. Aptly enough, iOS 10 has 10 major features, including sweeping new upgrades to Messages, a much more intelligent Siri, and a Memories feature in Photos that recognizes objects, people, and even locations. Introduced on Monday during WWDC, iOS 10 also makes the iPhone sublimely integrated with third-party apps. Developers can now design apps to directly enhance Messages, Siri, Maps, and Notifications. There’s also better integration for VoIP calling and a brand-new Home app. 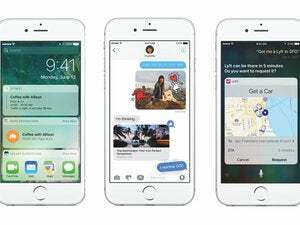 Apple’s most noticeable update comes to Messages, which the company said is the most frequently used app on iOS. 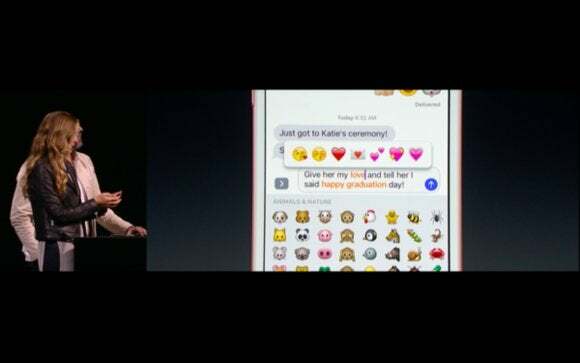 In addition to opening up the iMessage platform to third-party developers, Messages in iOS 10 has gone through a major “emojification.” Emoji sent by themselves are three times bigger, and with iOS 10 it’s easy to simply tap-and-replace certain keywords with emojis. 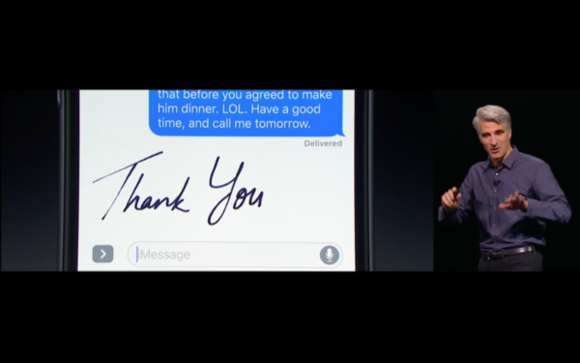 Messages has other visual enhancements, including rich links and in-line video and Apple Music playback, as well as bubble effects, full-screen effects, handwritten messages, Digital Touch interactive greeting cards, Tap Back for quickly responding to a text, and Invisible Ink that you can swipe away to reveal a message or photo. Other major Apple services that were opened up to developers include Siri and Maps. With Siri on iOS 10, you can now do something as simple as request an Uber or enable another third-party app thanks to the just-released SiriKit. Next-level Siri intelligence was also brought to QuickType, so whenever you get a text asking where you are, Siri will suggest dropping a pin, as well as store recent addresses, access your calendar availability, and offer multilingual support without having to change keyboards. And with Maps extensions, you can make a reservation using OpenTable without leaving the Maps app. Additionally, Maps has gotten more proactive Navigation so you can see the traffic on the route ahead or spot any upcoming gas stations or restaurants. Apple also spruced up its long-ignored Phone app in iOS 10. Most notably, there’s a new voicemail transcription service that transcribes audio voicemails into text, as well as new detection of potential voicemail spam. 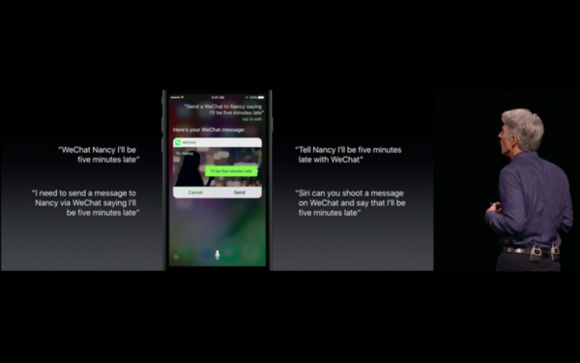 Apple also introduced a VoIP API, so that whenever you receive a call from Skype or WhatsApp, it will look like a native Phone call. 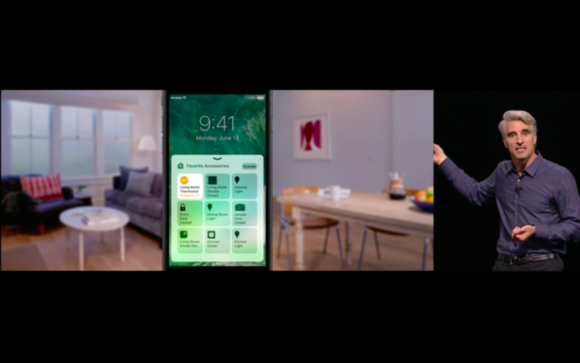 There’s also a brand-new Home app to control all your HomeKit-enabled devices around the house. In addition to tapping your devices on or off, you can use Home to set specific Scenes, like closing the shades and locking the front door before going to bed. Other native apps like Apple Music, Photos, and News also got updated. Besides a new look, Apple Music now has integrated song lyrics. Photos has a new Memories tab that stitches together your photos based on facial recognition and location that’s all stored on-device to protect your privacy. And News will let you read paid-subscriptions like National Geographic and The Wall Street Journal. Plus, you’ll be able to view conversations in Mail, edit your Live Photos, and use Split View in Safari for iPad. Stay tuned for more information on iOS 10 and WWDC.